We’ve got new 451mm Stelvios but they’re not called the Stelvios. The Duranos have the same specs only with a seamless Dual Compound tread that’s supposedly super long lasting. Sorry, only wire bead. 406mm versions exist in wire bead and folding bead but we’re not going to be stocking those until we get through our stock of last year’s Stelvios, which it seems that they’re still making. The Kojaks are going to replace the 349mm Stelvios. They are 1.25″/32mm rather than 1.125″/28mm but they are slick and still pump up to 115 psi. And don’t worry: they’ll fit with clearance on your Express tikit with fenders. We’re only selling the folders. We may get the 406mm versions later in the year. We’ve got your balloon tires for those of you with 406mm tandems, Pocket Llamas, or Pocket Gnus: 406mm Big Apples in a 2.0″/50mm width. Wire bead. Hate flats? Problem solved for every wheel size except the 451mm bikes. You can get the Marathon Plus in 349mm in 1.375″/35mm width or 406mm in 1.35″/35mm or 1.75″/47mm width. The latter will get up to 70psi whilst the others get up to 95psi. Wire bead. The lightweight version of the Marathon, the Racer, comes in folding or wire bead in 406mm in 1.50″/40mm width and 80psi max. Sometimes I don’t find out about things until it’s too late. 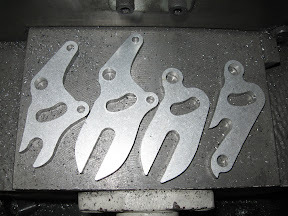 Paul Webb, being the kind soul he is, alterted me to the fact that Rob‘s been working on a series of new dropouts that will interface with the system created for the One Way and the Season tikit. You can see them here from left to right: disc brake version, Rohloff disc brake version (uh oh, Vik‘s in trouble now), Rohloff version, and standard derailleur version. Technically there is one kink left to be worked out of the Rohloff version, but it’s a minor adjustment and we should have the new version shortly to test out. Still, we’ve managed to fit it to a bike as you can see here. Within the week this one should be ridable at the factory, so if you want to come down for a test ride, we can do it. As for the disc brake version, we’ve just put it on a really blinged out Alfine Season tikit and it worked without a hitch. It’s only too bad it’s got hydraulic discs on though because the standard brake line is way too short. There’s going to need to be some extra work done on this one, so don’t get overly excited about the concept of hydraulics! Still, the proof is in the pudding: it’s ridable. This one’s going out to a customer; can’t wait to see what they think! 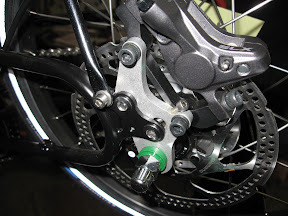 The disc mounts in front, by the way, are two threaded posts mounted to the back of the fork. Just in case you’re curious. The coolest thing about all of this is that if you have this system (say, you already have a One Way or a Season tikit), you can easily switch to any of the others without making any frame changes or anything. 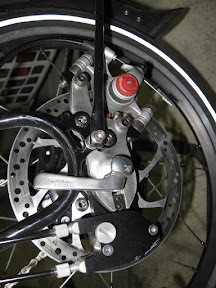 What’s even crazier than that is that if you have the derailleur version (which can be useful even if you have a internally geared hub or single speed with a chain tensioner– which, by the way, is bad on a fixed gear!!) you have a somewhat adjustable wheelbase. How cool is that? Those of you that have really been keeping track of things may wonder how Paul Webb managed to get these on his standard tikit. He bought a new frame and changed all the parts over, which is an option to all you other folks. Get in touch with the service department to make that happen. Being that this is the down time, this is a perfect opportunity for that!